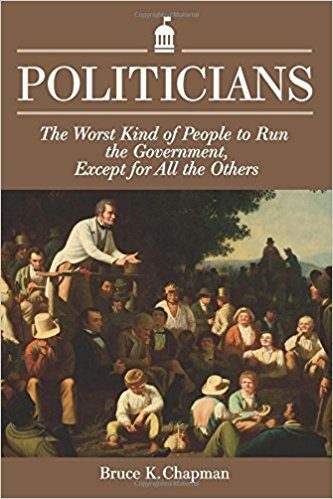 Discovery Institute founder and chairman of the board, Bruce Chapman, has published a new book, Politicians: The Worst Kind of People to Run the Government, Except for All the Others. The following is an excerpt from the book, published at Evolution News. The materialist influence of 19th-century thinkers still chills 21st-century thinking. It is true in biology, economics, culture, and government. In much of the popularization and misuse of the claims of natural science and in much of modern German philosophy, tendencies toward atheism and gnosticism (searching for hidden meanings) are found. So are economic determinism and a serene resolve to change human nature. It was considered foolish by many 19th- and early 20th-century intellectuals to believe in God or self-evident truths, but “advanced” to aspire to the perfectibility of man. Progress, you would have thought as an intellectual in that period, must proceed on “scientific” principles. Max Weber’s “fact/value” distinction meant that facts alone could be submitted to scientific inquiry, while issues of right and wrong (“values”) could be examined only from outside their own assumptions. In the new political science that developed in the Progressive Era, study of what constitutes wise opinion was dropped. Replacing it, as Martin Diamond has explained, was the study of opinion formation. Here, then, is partly where we get our present day intellectual prejudice against crediting what politicians say they are doing and our constant suspicion that the real truth must be something else. A central progressive theme was historicism, crediting history almost exclusively with the development of culture. It arose in Germany as an element of the “science of the state” (Statswissenschaft) and the “general theory of the state” (Allgemeine Staatslehere). And it fit well with the new science of politics, Politische Wissenschaft. With the new method, known states were compared historically, with perfection of the state as the goal. In the latter half of the 19th century, these ideas entered the United States in the heads of young Americans who, lacking domestic graduate schools in public law, embarked on studies in Germany. There they found that the new political science not only had the blessing of the government, but also was a participant in that government and helping to guide it. The students were impressed by such implicit power. The state commanded the universities and the universities taught the grandeur of the state. Prussian administrative skill seemed especially admirable. When Prussia united Germany and then won a war with France, the superiority of German efficiency seemed clear to the young visitors. A generation earlier, the first American convert to Teutonic ideas of political science and the founder of its U.S. version was John W. Burgess. True, Burgess did not hold that the interests of the state and the government were identical, and he did try to carve out a sphere in life for human liberty, but these distinctions soon were lost to his successors. Moreover, he espoused racism, along the lines of German biologist and Darwin enthusiast Ernst Haeckel, a historical reality that has become an embarrassment for Columbia University in our time. Columbia hired Burgess in 1876 and permitted him to open a graduate department in 1880. That department and a subsequent new political science department at Johns Hopkins University in Baltimore, also under German-trained instructors, helped shape the America field of political science over the next generation. From Columbia came the new journal Political Science Quarterly in 1886, and under Columbia’s influence in 1903-1904, the American Political Science Association was founded. Its appeal was such that membership rose from 214 in 1904 to 1,462 in 1915. From political science at Johns Hopkins, meanwhile, came a number of historicist scholars, including Woodrow Wilson. We can chart the Progressive Era from the 1880s because of the work of Wilson. His Congressional Government, in 1885, written at Princeton without ever visiting the halls of Congress, opened the subject of the Constitution and Founding to fundamental criticism. Wilson reduced the Constitution to a size that would fit under the microscope of the new science of politics. Indeed, “all that progressives ask or desire is permission…to interpret the Constitution according to the Darwinian principle.” In Wilson’s view, the Constitution should not restrict government, but rather provide a process for endless government expansion, ultimately carried out by civil service experts. Wilson’s idea of constitutional government was the opposite of the interpretation provided by The Federalist Papers, which emphasized both limited and balanced government. In America today, Darwinism’s triumph in something called “political science” continues to batter at the philosophical foundations of republican government.